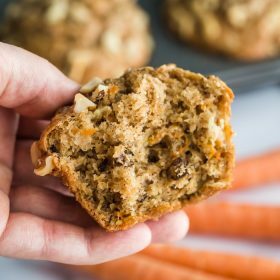 Healthy Carrot Cake Muffins- a SUPER simple vegan breakfast that you’ll find yourself making over and over again because they’re SO GOOD! Oh hey, hi! 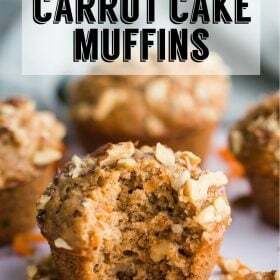 Yes, I’m sharing another muffin recipe. Are you sick of muffins yet because I’ve been sharing a lot of them lately but I’m not really at all sorry about it. 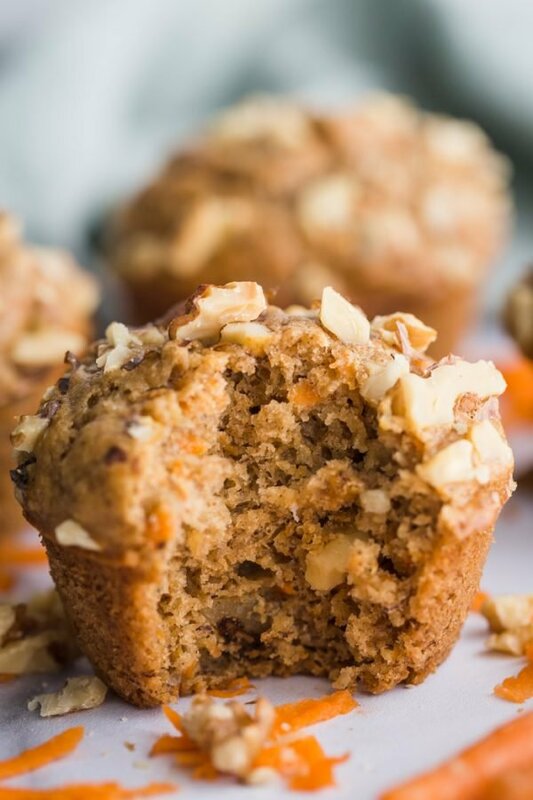 I know that I say this pretty much every single time that I post a new muffin recipe BUT these muffins are my new favorite muffins on the blog. I kept testing these under the premise of getting them “just right” but really, I just wanted an excuse to make and eat another batch of them. Once again, not sorry about it. I mean: LOOK how fluffy are these muffins!? And I know this picture makes it look like there are raisins in there but there are in fact no raisins. That’s just the skin of the walnuts that you see. 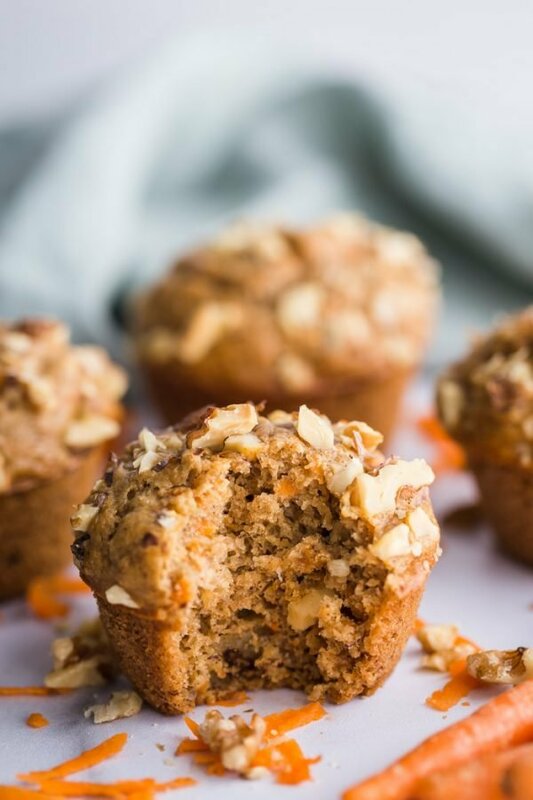 Here’s the one bad thing about these muffins: they’re at their peak right out of the oven while they’re still warm and soft. You can totally eat them after this, they just aren’t *quite* as good. And if you are going to eat them later, I HIGHLY recommend popping them in the microwave briefly (~30 seconds) to lightly warm them up. Warm muffins are the only way to eat muffins anyways, right? To keep these a little healthier, we’re ditching white sugar and using maple syrup instead. 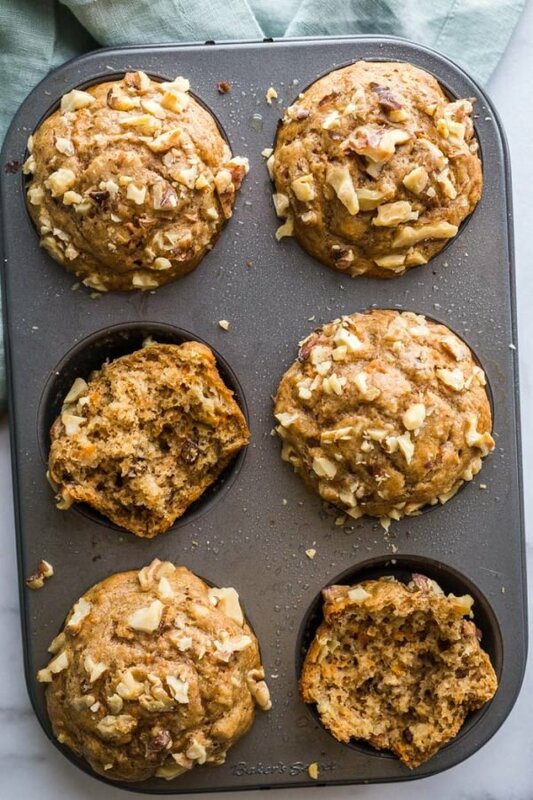 And to keep these muffins vegan, we’re using nut butter and mashed banana to bind these together instead of an egg. Simple and easy! 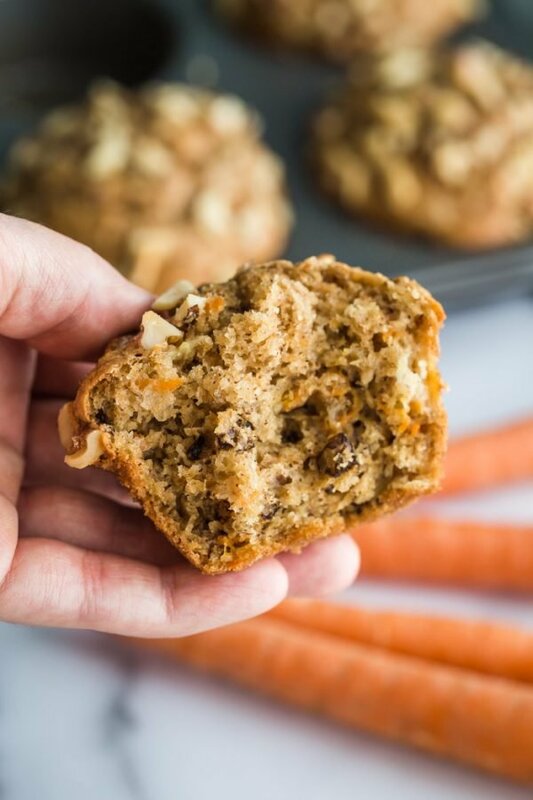 Can you make these muffins gluten free? While it’s on my to-do list to test a gluten free version of this recipe, I have not been able to get around to it yet. However, I’m confident that you can use any gluten free 1-1 flour. I’ve had great luck with THIS Bobs Red Mill gluten free flour and THIS Cup4Cup gluten free flour. 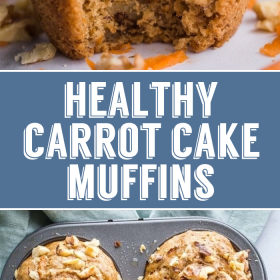 These muffins are ridiculously easy to make and I worked it so that you only have to dirty ONE bowl (instead of mixing the wet and dry ingredients in 2 different bowls). The banana is mashed and then the other wet ingredients are mixed in. Once that is fully combined, we add in the dry ingredients and mix. Then bake and BAM amazing muffins! DO YOU NEED MUFFIN LINERS? I find muffin liners completely unnecessary and even a waste. The only time that I find them useful, I guess, is if you’re making muffins/ cupcakes to take to a party. Then it can be nice to have some sort of barrier between the muffins and lots of hands that might be touching them. Otherwise, I just spray the pan well and never have any issues with the muffins sticking at all. Alternatively, you can use THESE silicon liners that are easy and reusable. I have some and they can be run through the dishwasher which I love! There is also THIS silicone muffin tin which looks rather handy! Stir in the milk, nut butter, maple syrup, vanilla extract, and mashed banana. Stir until well combined. Gently stir in the grated carrot and nuts. Evenly spoon the mixture into the 6 muffin cups. Top with a few more chopped nuts if desired and bake in oven for 20-25 minutes or until golden brown. Can you use coconut flour? I do not recommend it as coconut flour is vastly more absorbent thatn regular flour. I want to work on a coconut flour version of this but I have not done so. The only thing I have actually tried out is a gluten free 1-1 flour from cup-4-cup.